So, Battletoads. The cartoons and video games of the 90′s were rife with anthropomorphic action heroes with a fondness for surfer slang. These characters arose in an attempt to cash in on the Ninja Turtles of course, and of the various Ninja Turtle imitators, the Battletoads are possibly the only ones worth mentioning. The Battletoads were the stars of a video game, which even today is notorious for its difficulty. And here’s the funny thing about me and video games: I am terrible at them. I like playing video games, and I love the mythology of video games, but I don’t have much time for them, and generally, I’m terrible at them. I’ve passed/fully unlocked maybe 5 video games in my life. So it goes without saying that I never even came close to beating Battletoads. And yet I just said it. Hunh. 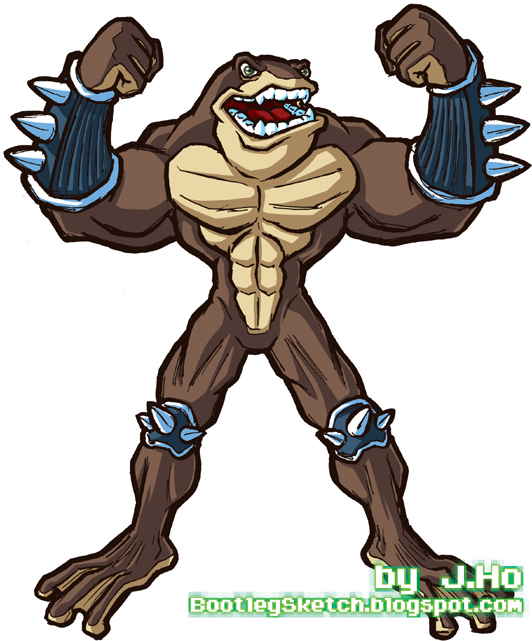 Charles actually suggested that I draw the Battletoads over a year ago. I followed that suggestion immediately… but didn’t ink and color these guys until two weeks ago. Yay for procrastination? Tune in next week for the third of the Battletoad trio! < Previous What’s a Spector? Nice man…this is one tuff lookin’ toad!, who I almost want to see wearing some pants,….almost. GULP!